Imagine issues linked to positions and objects in your model. All the information at hand to lookup, create and solve issues. Save the issues in the cloud so your team can access them, from anywhere at anytime and from any BIM application. BIMcollab's issue management simplifies this process and offers a structured way of storing, sharing and managing issues. But most important: you have the information right where it's needed: directly within your clash detection- or BIM authoring-tools. The most popular BIM tools like Revit, ARCHICAD, Navisworks, Solibri and Tekla are linked directly through our integrated BCF Managers; others via BCF file exchange. In any construction project many unexpected issues arise, which are hard to keep track of. Using BCF files helps, but you eventually end up with an unmanageable amount of files and versions. How do you know what is communicated with whom and with which file? And generic issue management systems lack the key aspects vital for multidisciplinary construction projects. That is why we created BIMcollab: an easy-to-use and powerful issue tracker in the cloud dedicated to BIM. Issues in BIMcollab are directly linked to positions and objects in your model, accessible via browsers or directly from your BIM application. Create reports from sorted set of issues in XLS or PDF format directly from the issue-list pages: what you see is what you get. The activity overview shows all activities since the last login or a specific period for selected team members. Simple and illustrative graphs offer instant insight into the workload and progress of your team. When you are a developer of BIM software like a modeler, checker, viewer or other, you can use our developer libraries to create dynamic links from your software to BIMcollab. The libraries are easy to use without a long learning curve for building web-services. Just call the connect function with URL, username and password, and you can query all information in a BIMcollab project via a simple set of API-calls. We have versions for C++ (.NET or Borland for Windows, Xcode for MacOS), C# and Java (both for Mac and Windows). You can use dll’s or link the libraries directly into your codebase. Part of the package is a free sample code to get a kick-start in your development. Integrate the example code in your software and connect it to your model-data-structures and model-views. 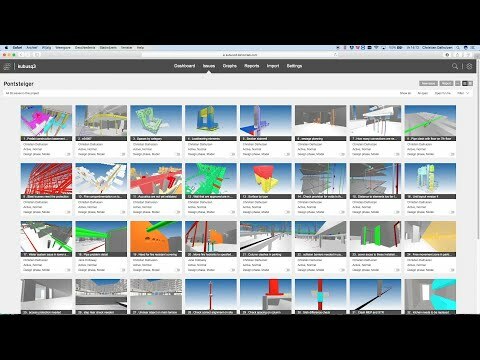 BIMcollab ZOOM brings model viewing and validating fully integrated into the BIMcollab workflow. ZOOM is the best tool to discuss issues in design review meetings within the context of discipline models. ZOOM completes BIMcollab’s issue management workflow, together with the web application and all the add ons in BIM authoring tools. BIMcollab now offers a complete set of tools supporting your BIM issue management, essential to create high quality BIM data for great buildings.